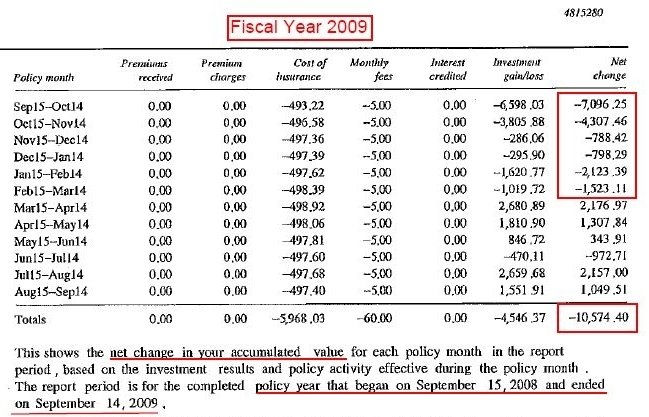 August 12, 2011 . . .
. . . and yet again in writing on October 12, 2011, along with numerous phone calls throughout the nearly 2 1/2 year period (891 days to be exact) in which Lincoln Life filibustered a cooperative response. Mr. Young had to undertake extraordinary measures because beginning in May 2009, he was oddly unable to obtain information on HIS life insurance policy which HE established and paid for. Of interest, in years prior, Mr. Young encountered no difficulty whatsoever in obtaining information on THIS particular life insurance policy. So what changed? In a word . . . MorganStanleyGate. In 2000, Spencer C. Young prudently arranged financial protection for his wife (Maria Young) and three sons (Michael, Kevin & Ryan Young) to preserve their standard of living and ensure his son's college educations in the event of his untimely passing. He established a $1.5 million variable whole life insurance policy using a REVOCABLE trust structure, with HIM serving as its SOLE trustee during his lifetime. Upon his passing, his wife would serve as co-trustee, along with Morgan Stanley, with all financial and investment decisions to be decided upon unanimously -- at the time, Mr. Young was an Executive Director at Morgan Stanley. Mr. Young set up the life policy in a trust format with a prominent investment firm serving as co-trustee upon his passing because his wife, Maria had no financial background whatsoever. However, during his lifetime, he would fulfill the role as SOLE trustee, thereby enabling him to have complete flexibility and autonomous control over the policy, and all investment and distribution decisions over the trust because of his extensive financial career and educational background. Unfortunately, as a result of the unrelenting and often overwhelming stress brought about by MorganStanleyGate, which began in November 2002, Mr. Young's marriage of 24 years ended in January 2008. Mr. Young first became aware something was amiss when he made a routine inquiry about the policy in May 2009, and was oddly denied access to information about his life insurance policy by Lincoln representatives. When Mr. Young asked why, he was told information about the policy could only be shared with the Trustee (note: Mr. Young had personally structured the Trust so that HE was the Trustee). Here's how the conversation then proceeded, and note this conversation is representative of what Mr. Young has often encountered when confronting one of the many elements of fraud and corruption in the MorganStanleyGate scandal. And if this wasn't such a serious matter, it would be hilarious, for the failure to communicate bears some similarity to the famous Abbott & Costello "Who's on first?" routine (access video below); however, in Mr. Young's situation, it's not that he didn't understand . . . it's just that Lincoln flat out refused to provide information on the policy even though it was taken out by and paid for by Mr. Young ! And it was only through numerous calls to many different Lincoln representatives that he learned the policy had not lapsed, despite making no premium payments since 2003. Mr. Young: "I AM the Trustee !" Lincoln Rep.: "According to our records, you are NOT the Trustee." Mr. Young: "What?!? Then WHO is the Trustee?" Lincoln Rep.: "We are not allowed to divulge that information." Mr. Young: "Why not ?!?" Mr. Young: "You MUST be kidding -- it's a policy on MY life that I took out using a trust where I am the SOLE trustee! What 'records' indicate someone else is the Trustee?" Lincoln Rep.: "Our internal records." Mr. Young: "You mean the governing trust agreement for The Young Family 2000 Trust"? Mr. Young: "Please send me a copy of what you have'"
Lincoln Rep.: "We don't have a copy of the trust agreement"
Mr. Young: "What ?!?" You just said you had the trust agreement"
Lincoln Rep.: "No I didn't"
Mr. Young: "Yes you did"
Lincoln Rep: "No, I meant to say our internal records reflect the contents of the trust agreement"
Mr. Young: "How did your internal records get this information from the trust agreement?" Lincoln Rep: "I can't say." Lincoln Rep: "Because I don't know." Lincoln Rep: "Our systems merely indicate the source of our information"
Mr. Young: "Then how did your systems obtain this information?" Lincoln Rep: "I don't know"
Mr. Young: "What ?!? So you don't keep a copy of the trust agreements governing your life ins. policies?" Mr. Young: "So it's a complete mystery as to how this information got into your internal systems?" Maria Young was designated as the SOLE TRUSTEE, and upon Mr. Young's passing, Maria's brother, Joseph Lombardi was to become a co-trustee. Prevented Mr. Young from canceling this policy to remove financial incentives associated with the dastardly plan to end his life, which were sadly amplified by the financial destitution and dire health condition Maria Young was facing at the time . . . all of which were manifestations of MorganStanleyGate. 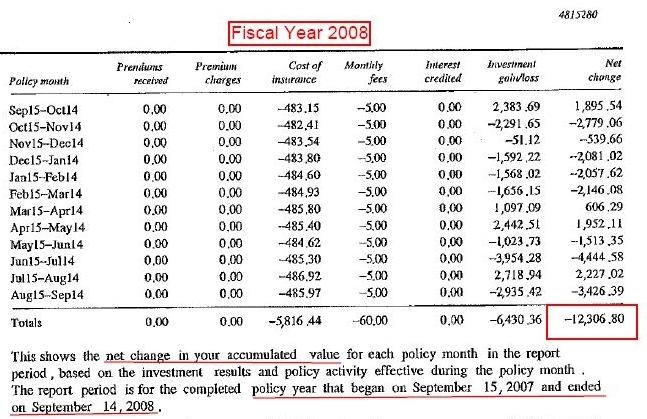 Below is a summary of the insurance policy information Mr. Young gleaned from the documents that were finally provided by Lincoln, which took 891 days (or roughly 2 1/2 years) to finally receive. 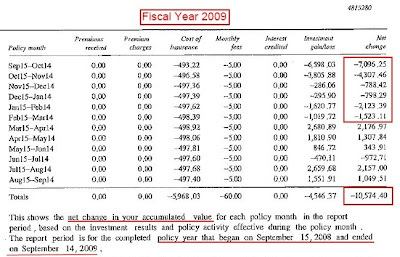 In light of the relatively low policy value, recent declines in policy value in 2008 and 2009, and the large declines in the two months preceding the remittance of the mysteriously missing insurance premium in early June 2010 (see below) it would be prudent to make a premium payment if someone was planning to collect on this policy in a year to mitigate the risk that a market decline would cause an inadvertent cancellation of this $1.5 million policy. 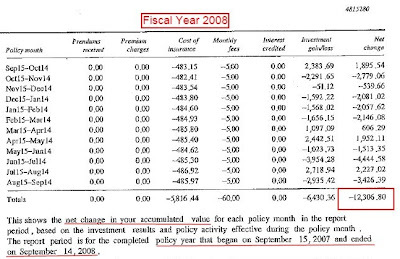 Reflected below is the schedule of premium payments made on the subject life insurance policy, which is conspicuously missing the premium made by an unspecified source in Q2 of 2010, as per Richard Scacheri of Lincoln on Jun. 14, 2010 and later confirmed by a woman at Lincoln who would only identify herself as "Heather". 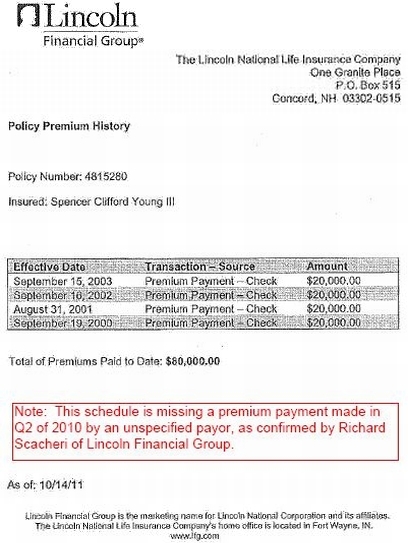 Although Lincoln representatives had earlier indicated a "large premium payment" was received in Q2 2010, this payment is mysteriously missing from the life insurance policy records released by Lincoln Life Ins. Co., after a two-and-a-half year delay. Understanding WHO the payor was would likely pave the way toward a swift ensuing resolution of the MorganStanleyGate scandal.